WASHINGTON, D.C. -- Two years into Donald Trump's presidency, Americans remain most satisfied with the state of U.S. military strength and preparedness (78%) and the nation's security from terrorism (68%), among a list of 22 policy areas. At the other end of the spectrum, the public is least satisfied with the nation's campaign finance laws (20%) and its efforts to deal with poverty and homelessness (25%). Gallup has asked Americans about most of the 22 policy areas each January since 2001 except for 2009-2011. The latest findings, from a poll conducted Jan. 2-10, reveal that just five of the issues currently garner majority-level satisfaction from the public. The position of women, the state of the economy, and the acceptance of gays and lesbians top the satisfaction list behind military strength and security from terrorism. At the same time, majorities of Americans are dissatisfied with 11 of the nation's policy areas. In addition to campaign finance laws and poverty, these issues are healthcare, race relations, education, immigration, federal taxes, gun policy, the environment, the role of the U.S. in world affairs, and abortion. 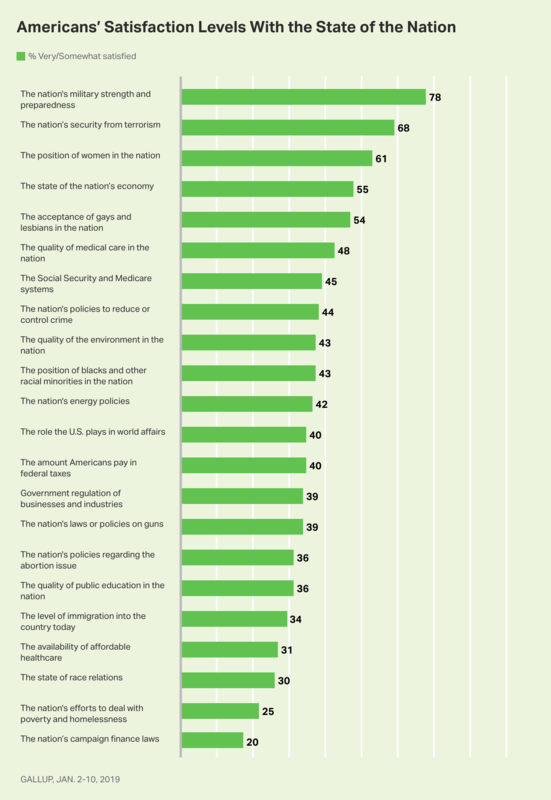 The public is more closely divided on the remaining issues -- Social Security and Medicare, crime, the quality of medical care, the position of racial minorities, and government regulation of businesses and industries. For the most part, satisfaction levels now are similar to last year's update, which found sharply higher satisfaction with security from terrorism, the nation's military strength and the economy. Last January, the first readings of Trump's presidency, the satisfaction levels of Republicans and Republican-leaning independents rose from 2017 on every issue measured, including many by double digits. Over the same period, Democrats and Democratic-leaning independents became less satisfied on most issues. These partisan changes would be expected, given the switch in party control of the White House; the differences remain in 2019. The largest gaps in satisfaction between Republicans and Democrats are seen in views of gun policy (49 points), the position of blacks and other racial minorities (44 points), the environment (43 points), the economy (43 points) and the role of the U.S. in world affairs (40 points). Despite their sharp differences on 13 of the issues measured, Republicans and Democrats have similar levels of satisfaction on nine others, those with fewer than 10 points between them. Majorities of both Republicans and Democrats are satisfied with three of those issues -- the strength of the military, security from terrorism, and the acceptance of gays and lesbians. 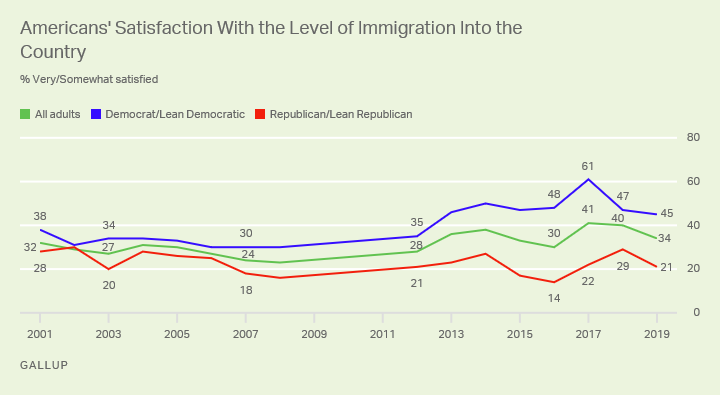 The one issue that Democrats are much more satisfied with than Republicans is the level of immigration into the country. Americans' satisfaction with the level of immigration into the U.S. fell to 34% this year from 40% a year ago, largely attributable to an eight-point drop among Republicans, to 21%. The survey, which was conducted during the partial government shutdown that occurred when Trump and Congress failed to come to an agreement about a wall on the U.S. border, found 45% of Democrats satisfied with the country's level of immigration. Those who registered dissatisfaction with the levels of immigration into the country were asked a follow-up question to gauge whether they'd like to see it increased, decreased or kept the same. While the views of all adults are split, a 47% plurality of Republicans are dissatisfied and would prefer decreased levels of immigration into the U.S. Democrats who are dissatisfied with immigration levels are much more likely to say they want more immigration or want it to remain the same than they are to call for a decrease. Americans' satisfaction with the quality of the environment, which fell seven points in 2018 to 45%, has dipped to a new low of 43% this year. Democrats' satisfaction with the environment declined six points this year to 26%, also an all-time low. 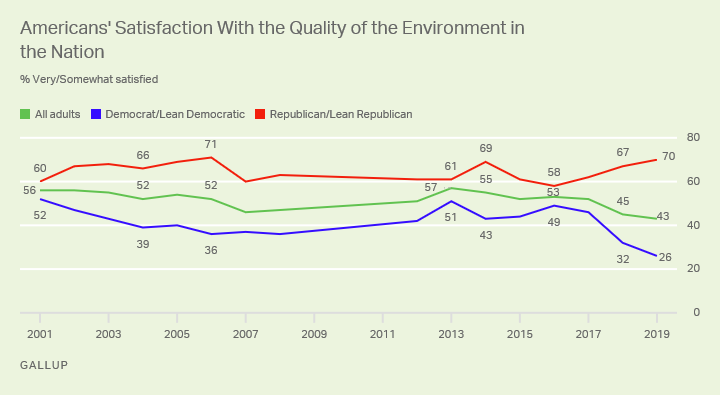 At the same time, Republicans remained largely satisfied with environmental quality. 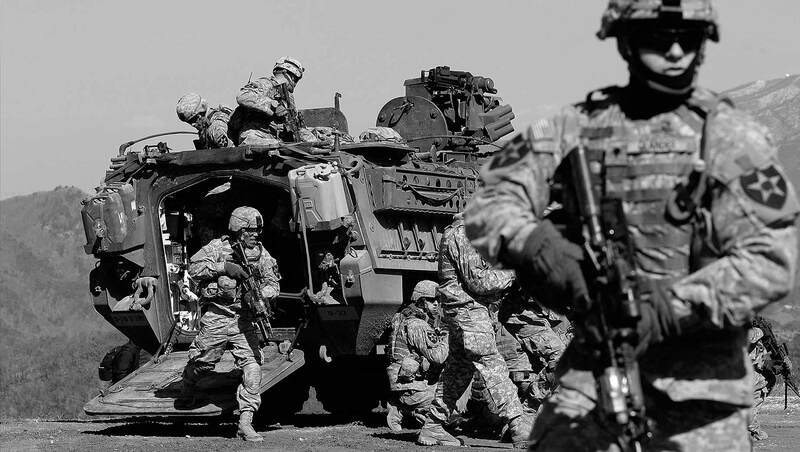 Americans, regardless of their party affiliation, remain largely satisfied with the nation's military strength and preparedness and its security from terrorism. 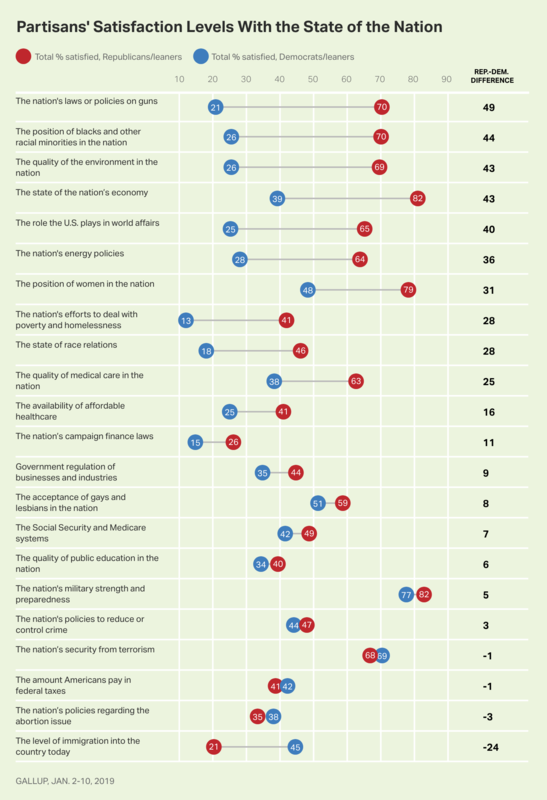 And while majorities of adults overall are also satisfied with the position of women in society and the nation's economy, partisans hold very different views. In fact, Republicans and Democrats differ by at least 24 points in their satisfaction levels for half of the 22 policy areas measured by Gallup. The latest shutdown, spurred by Americans' sharp partisan divide over immigration, reflects this age of hyperpolarization and lack of compromise in Washington. Results for this Gallup poll are based on telephone interviews conducted Jan. 2-10, 2019, with a random sample of 1,017 adults, aged 18 and older, living in all 50 U.S. states and the District of Columbia. For results based on the total sample of national adults, the margin of sampling error is ±4 percentage points at the 95% confidence level. All reported margins of sampling error include computed design effects for weighting. The border debate pits the two issues Americans name as the country's most important problems, government and immigration, against one another.